01.04.2018 On the 8th of April, "Arche" center and "Schroedinger's cat" journal organise a popular scientific conference "Science in the field". Scientists will tell about their field research; our project will be represented by Olga Filatova. The money from the conference will be used to support one of the field projects. This time, our project was selected. Thank you very much! 02.04.2017 Kosatka Cruises is a team of young local people from Kamchatka peninsula. We met them in 2008 when they were starting their tourist business mainly kayaking around Avacha Gulf of Pacific Ocean. Since that they have built beautiful sailing catamaran and guesthouse, actively developing the local tourism. They help us a lot during field season and we give educational lectures to their tourist groups from around the world. This season we are planning to make a combined survey with Kosatka Cruises. They will support our field work during the survey and we will involve their tourist group into our research. We will be able to check new places onboard of the sailing catamaran Kosatka. We hope our collaboration contribute to developing responsible marine ecotourism in Kamchatka. 25.02.2017 Chimelong Ocean Kingdom announced that killer whale breeding base have been put into operation. Currenlty it has nine orcas captured in the western Okhotsk Sea. 23.02.2017 Olga Titova gives another lecture about whale evolution tomorrow at 16:00 at the festival "Pristine Russia". 28.01.2017 Today a member of our project Olga Filatova gives a public lecture about Marine Protected Areas for whales and dolphis in the Russian Far East at the festival "Pristine Russia". 02.09.2016 Our paper about white killer whales is published in Aquatic Mammals. 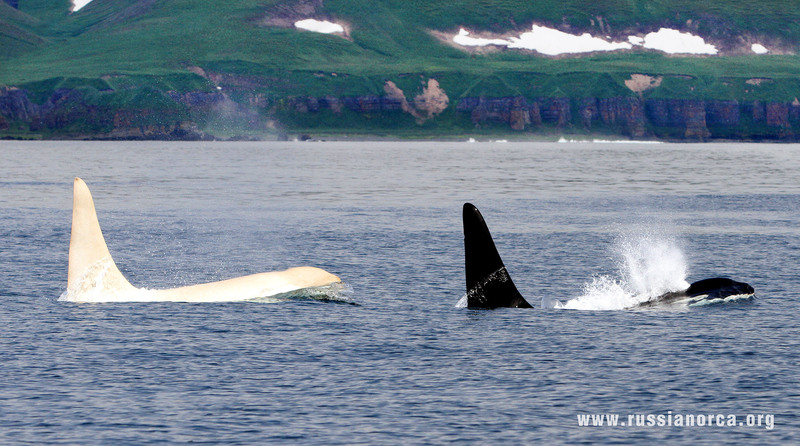 Over the years of our work, we have repeatedly encountered orcas with light, almost white coloration - probably albinos. Three of them we met in the waters of Commander Islands - a juvenile called Lemon, a female Mama Tanya and the famous male Iceberg. We photographed one more white juvenile off Paramushir Island in northern Kurils, and a white female with white juvenile were observed from a tourist boat off Sakhalin Island. 03.06.2016 Our field season have started! Follow our news on Facebook. We are grateful to Iridium360 for providing us with satellite communications during 2016 field season. We are also grateful to Denis Gavrilov who provided us with a new boat engine, recorder and GPS navigator. 02.10.2015 On 9-11 October, Moscow will host the Festival of Science, which will include several lectures by the members of our project. On Saturday, 10th of October at 10:30 Olga Filatova will give lecture "Cultural traditions in whales and dolphins" in MSU Shuvalov Building, at 12:30 Tatiana Ivkovich will give lecture "Encounters with orcas" in Zoological Museum, and at 14:00 Eugenya Lazareva will conduct an interactive lesson for children 'Leisure or work: why photograph whales?" 31.05.2015 The field season is starting - one part of our team is already at the Commander Islands, and another one is getting ready to fly to Kamchatka. Follow our news on Facebook! 16.04.2015 Participant of our project, a 4th year student at Biology Faculty of Moscow State University Asya Danishevskaya has been awarded 3rd place in the "Lomonosov" student competition with a talk titled "Using of inter-group and group-specific call types by resident killer whales in Avacha Gulf of Kamchatka Peninsula depending on the social context". Congratulations! 24.12.2014 Dear friends, we wish you happy holidays, and as a gift we give you a calendar with beautiful photographs of our orcas and interesting facts about orcas and our project. You can download it for free and print out. We hope it gives you joy and inspiration for the whole year! We wish you good health and good luck in the coming year! Happy holidays! 25.10.2014 The long-awaited website update! Now you can see the photo of every individual from the families that often visit Avacha Gulf in the section Our orcas. 12.10.2014 On September 22-27 the conference "Marine Mammals of the Holarctic" took place in St. Petersburg, Russia. We have attended the conference, and becides talks and posters about orcas and other whales of the Russian Far East, we participated in the round table "Problems of cetacean capturing" and screening of the film "Blackfish". Read more>>>. 22.12.2013 In December the Biennual Conference of the Society for Marine Mammalogy took place in New Zealand. The members of our project presented their results of the research of killer whales and Baird's beaked whales. There was also a panel discussion on killer whales in captivity, where the situation with capturing orcas in Russia was discussed among other things. 27.10.2013 New confirmed information: Four more orcas have been captured somewhere in the Sakhalin Island area by the same company as before. In total, now there are eight captive orcas in Russia: Narnia captured last year, plus seven captured this year. We are trying to find out more details and will post as soon as we can confirm them. 13.10.2013 Two of the newly captured Russian orcas - a juvenile female and a young male - are thought to be headed for an aquarium in China. That leaves Narnia, and a mature female in Russia. This mature female could be the mother of the two who are headed for China. 10.10.2013 More details about the recent capture. A young male, adult female and juvenile female killer whale were captured recently in the Sea of Okhotsk, eastern Russia, about 50 km south of the place where the young female orca Narnia was captured a year ago. They were transported in trucks for more than 1000 km to the south to the net enclosure near Nakhodka (Vladivostok area) and placed in the same net pen where Narnia was kept for the past year. The three captives were reportedly in a very bad condition after the transport. They refused to eat. The trainers could do nothing. Finally, we've heard, that Narnia herself tried something. She brought fish to the three captives and gave it to them. In this way she was responsible for persuading them to eat. This is not the first time one captive has helped others in the same situation. In the book Orca: The Whale Called Killer, Charlie Chin (M1) from the transient M pod encouraged a female in the pod to eat salmon - of course this is strange food for transients - after more than 2 months of refusing to eat. Regarding the four orcas now in Nakhodka, two of them are rumoured to be headed for Moscow in November to be placed in the Oceanarium which is being built in the All-Russia Exhibition Centre. Two others are rumoured to have been offered for sale abroad. 27.09.2013 We have information from unofficial sources that three orcas were captured recently in the Sea of Okhotsk, Russia, by the same company that captured the orca Narnia in 2012. These orcas are believed to be being held with Narnia near Vladivostok. We will let you know when we find out more details about the capture and ultimate fate of these orcas. 16.05.2013 Total allowable catches for marine mammals for 2013 are now available. It will be allowed to catch ten killer whales: six in Northern Okhotsk subzone, two in Western Kamchatskaya, and two in Eastern Sakhalinskaya subzones. 15.04.2013 Last week our team participated in the Conference of the European Cetacean Society in Setubal, Portugal. We presented posters on the results of our research, and FEROP co-director Erich Hoyt received ECS Conservation Award as a recognition of his efforts in whale and dolphin conservation. 19.02.2013 19th of February is a World Whale Day. On this day, people traditionally think of the countless victims of commercial whaling, which devastated the seas in both hemispheres. Now whaling is banned in most countries. In Russia whaling is permitted only for the needs of the indigenous peoples of Chukotka. But in recent years another, much more cynical type of whaling began to grow - capturing for dolphinariums. Animals are captured by the quota "for scientific, cultural and educational purposes," but most of them are sold in commercial dolphinariums abroad. The opinion of leading experts is ignored while calculating the capture quotas. The process of capturing is not controlled, and no one counts how many animals die during the capture. Capturing of marine mammals is a shame for Russia! 28.01.2013 On 22 January, the Russian Marine Mammal Council held its meeting where live-capturing of orcas, walruses and beluga whales was discussed. Olga Filatova presented the recent scientific data on the population structure of orcas and noted that these data were ignored when assessing the total allowable catches for the species. Furthermore, in her report, she showed that the abundance estimates used to calculate the total allowable catches of orcas in the Sea of Okhotsk were not reliable, and the level of reproduction of orca populations, which is needed to calculate the total allowable catches, was never assessed by fisheries bodies. After the discussion, the Council decided to recommend to change the procedure for evaluating the total allowable catches and fishing regulations in accordance with the scientific data. 05.12.2012 The meeting of the Russian Marine Mammal Council was held on 4 December. On this meeting Olga Filatova gave a talk "New data on the population structure of killer whales of the Russian Far East: suggestions for population management". The report emphasized the need for separate assessment of abundance of killer whales from fish-eating (resident) and mammal-eating (transient) populations and claimed that the estimate of 2.5-3 thousand killer whales in Okhotsk Sea, calculated by VNIRO (All-Russian Research Institute of Fisheries and Oceanography), violated generally accepted standards of marine mammal accounts and did not consider the separation of fish-eating and mammal-eating populations of killer whales. The reaction of the Council to the report was generally positive, but faced strong opposition from Dr. A.I. Boltnev (VNIRO). Dr. Boltnev said that fish-eating and mammal-eating specialization of killer whales is the result of individual strategies, and he claimed he did not believe that killer whales of different food specialization belong to different populations. He did not bother to take into account our references to multiple publications of foreign scientists, and questioned the results of our own genetic analysis. The debate on this issue has been blocked by the Chairman of the Council academician A.V. Yablokov, due to time constraints. As a result, the Council did not accept our suggestion for separate assessment of fish-eating and mammal-eating killer whales. 05.10.2012 Administration of LLC "Sochi Dolphinarium" officially denied the information about capturing and death of the second orca: "We inform you that in accordance with the Order N395 from 05/05/2012 by the Federal Agency for Fishery LLC "Sochi Dolphinarium" received a permission to catch killer whales in the Northern Okhotsk Sea subzone. On the basis of the permits in 2012 LLC "Sochi Dolphinarium" captured only ONE killer whale, for which it has all relevant documents. The animal is now being adapted at a specially equipped base." We are not aware of the origin of the rumors of catch of two killer whales." 27.09.2012 We have recently found out, that two orcas were captured in August in Sakhalin Gulf. The fate of one of them is unknown, and another, a young female, was transported to a dolphinarium in Vladivostok. Rumours are that she is going to Sochi Dolphinarium (Adler) (where the actual captors came from) OR helping to open up the huge new Vladivostok Dolphinarium on Russkiy Island OR maybe going outside of Russia. 17.09.2012 Our field season is finished. This year the participants of the Commander expeditions returned earlier than usual to atten the conference "Marine Mammals of the Holarctic", which will take place in Suzdal on 24-28 September. There we will report the latest results of our research. After the conference we will post the new photos and the field report on the website, and now you can follow the updates on our Facebook page. 12.07.2012 The middle of July is a hot time in the field. The expedition of our project have started working several days ago in Avacha Gulf of Kamchatka. Another expedition of our project have been working at the Commander Islands since mid-June, observing killer whales, humpback whales and other whale species. Both expeditions will work till late August - early September. 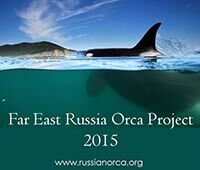 Mr. KAWAI is a big supporter of the Far East Russia Orca Project and Russian Cetacean Habitat Project. He designed our logos. We love his work. 23.04.2012 Unravelling the secrets of orcas and other whales in Russia: Read FEROP Director Erich Hoyt�s blog post. To read Nicolas Entrup�s SHIFTING VALUES blog More than just a picture, supporting FEROP, click here. To see our new video clip, go to this link. To see our new and exciting images, check out the image gallery. 19.02.2012 Today is the Whale Day. This holiday was launched in 1986, when the International Whaling Comission established the moratorium for the commercial whaling. In honour of this day we renewed the pages with photographs of orcas and other whales, adding photos from 2011 field season. 01.01.2012 The last year was successful for our orcas. Five new calves were born, three of them in Chizh family, and two in Nemo family. Unfortunately, there were also some losses - Hooky and Marusya were missing (which most likely means they have died). We wish our orcas to have more calves and less losses in the new year, and our visitors - good luck and success in all good initiatives! Happy New Year! 12.11.2011 Total allowable catches for marine mammals for 2012 are now available. It will be allowed to catch ten killer whales: six in Northern Okhotsk subzone, two in Western Kamchatskaya, and two in Eastern Sakhalinskaya subzones. 25.08.2011 Our field season is coming to the end. FEROP expeditions are working in two locations - in Avacha Gulf, Kamchatka and at the Commander Islands. The members of the Commander expedition had recently encountered an albino orca. It was a juvenile, which we had first photographed as a calf in 2008. 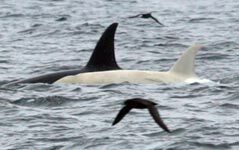 We hope to meet one of the two other albino orcas before the end of the season - a female we met in 2009-2010 and a large male encountered in 2010. 16.06.2011 Our expedition at the Commander Islands, started in the late May, is currently in full swing. We work with local Commander orcas, which are much more timid and fearful than our old friends from Avacha Gulf. Recently we have met a group which included a juvenile with hump, very much similar to the female Humpy from Hooky group which has died in 2008. Except orcas, there are also many Baird's beaked whales - very interesting and unstudied whales from Ziphiidae family. We continue the recently started work on the photoidentification of these whales to study their social structure and usage of the Commander Islands area.